Canada’s best universities are public with tuition that is generally much more affordable than that at most American universities. But how good an education does a Canadian school give you? What is a degree from University of British Columbia, McGill, or University of Toronto worth when stacked up against the best universities from around the world? That depends on who’s doing the ranking. The ranking systems are, quite frankly, a bit of a scam. They depend on subjective interviews and factors like “reputation” as judged by other academics. And most professors are like hyenas roaming the Serengeti looking for carrion to feast on: shrill-voiced, cowardly, but cruel and even violent if they have to be. So, some ranking systems favour British or European universities. Others favour North American or at least American universities. And the ranking differences for any given school can be substantially different, depending on what ranking system you use. Maclean’s ranking of Canadian universities, for example, suffers from around 10 major Canadian universities refusing to participate for over a decade now. They claim the rankings were too simple and too subjective. So, Maclean’s rankings were not used in compiling our own rankings. But even they could be used by people to consider some of Canada’s smaller universities and try to find one that fits one’s needs. It would therefore appear that 10% is an appropriate estimate for the margin of error to apply to the scores produced for all institutions. This seems reasonable for aggregate scores that combine subjective evaluations of institutional reputation, citation counts, income, coarse proxies for teaching quality such as staff-student ratios and even, in some cases, estimates to fill in data points that were not provided. Maybe that’s the way it should be. We constantly debate how to test high school children and how to measure and interpret the results of those tests in order to adjust their curriculum and improve their educational experience. Why should it be any different for universities? So, let’s take a look at the very subjective, but hardly meaningless, rankings of Canadian universities in 3 areas that are key to any economy or society: Engineering, Medicine, and Business. We’ll start off with Engineering and then cover Medicine and Business in another post. With a composite ranking in engineering that puts it at #127 worldwide, it comes in at number 6 in our rankings for best engineering school in Canada. Of course, most of your courses will be in French so it’s really only an option for francophones although it apparently provides extensive French language assistance for its students that need to improve their French language skills. It ranks highly in Medicine and Pharmaceutical studies as well and is associated with the Ecole Polytechnique. And Montreal is a wonderful city with fairly reasonable rents and with lots of bars and cafes for students to hang out in. Again, it’s good to understand what the bartender is asking you. So, if you’re willing to brush up on your French, this may be a good choice. From Quebec to the foothills of the Rockies. Ok, Edmonton is not quite as close to Canada’s most spectacular mountain range as Calgary is, but it’s a fairly easy drive to get to Jasper from Edmonton. And you pass through absolutely beautiful countryside before you even hit the foothills. The University of Alberta boasts Canada’s National Institute for Nanotechnology which is a crown jewel for any school looking to have a presence in technology and engineering. It has over 400 programs across 18 faculties, so if engineering doesn’t work out for you, there is surely some other course that will. Plus, it has good connections to Alberta’s energy sector. Ranking 115th worldwide in engineering, this is a good choice for anyone who wants a career in engineering. Remember we said the ordering of schools – whether you’re 3rd or 4th for example – is somewhat subjective? Well, Waterloo and McGill are basically tied with worldwide rankings across our surveys at 79th for Waterloo and 71st for McGill. So, Waterloo could have easily come in 3rd but this year they’re in fourth spot. Waterloo was planned and constructed with practical and technological perspectives in mind. This is the university that helped pioneer the co-op program in Canada, where you study a term and work a term, and in a field like engineering that’s a huge plus. This is the school that’s given us: Mike Lazaridis who helped found Research in Motion the company behind Blackberry; David Cheriton who teaches computer science at Stanford and was an early investor in Google – yes, he’s a billionaire now; Tech entrepreneur Steven Woods; and Kevin O’Leary of Softkey, Dragon’s Den and Shark Tank fame, among other notable alumni. This is a school for people who get things done. And it could easily be in the top 3. 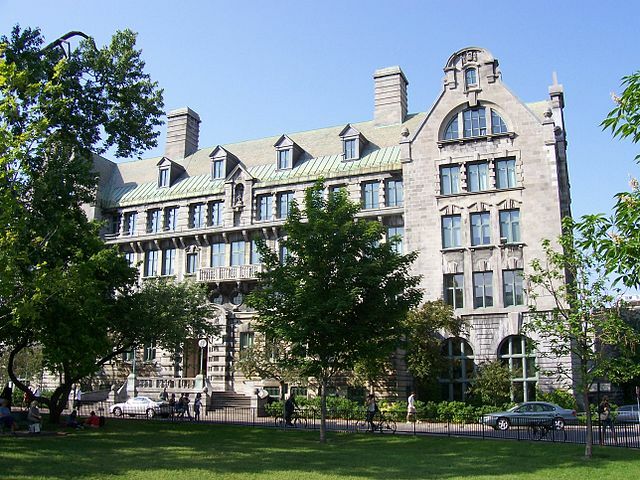 Like the University of Montreal, McGill is in a leafy beautiful section on the slopes of Mount Royal and close to any kind of entertainment you could possibly seek. It’s also in a city that has Canada’s best bagels by far. McGill’s fees are a little lower than those for schools like University of Toronto, even for international students. Research facilities are impressive, and it ranks at 71st for engineering. Be assured that courses are in English, though living in Montreal means knowing how to get by in French as well. According to QS Top Universities, Montreal is ranked by university students as one of, if not the, best cities to live in. With great skiing a short way up the Laurentian Autoroute (that’s what they call highways in Quebec) or down the Eastern Townships Autoroute and festivals and events around the year, the only complaint might be that it all gets a little distracting. It was inevitable that UBC would show up in a top 6 survey, and it comes in at number two with a composite ranking of 51st worldwide in engineering. Located in Vancouver facing the Pacific with a beautiful park behind it, it’s been one of Canada’s most prestigious universities for some time now with top level programs and an annual research budget of $600 million which funds about 8,000 research programs a year. Talk about investing in your students. It is home to Canada’s national laboratory for particle and nuclear physics and has the world’s largest cyclotron on campus. Its alumni include 8 Nobel laureates, 71 Rhodes scholars, and 65 Olympians. It also has Western Canada’s largest engineering school and engineering co-op program which works closely with industry. If you’re serious about a career in engineering, UBC is definitely one of the best schools to attend. Please don’t hate Toronto for being number one and coming in with a ranking of 40th in our worldwide composite ranking of engineering schools. Yes, Toronto is practically a city-state within Canada, with finance and industry and a large and diverse population in a hard-working city that’s a little too multicultural to be truly mid-western. But U of T (as Canadians call it) is and has been one of the best universities in Canada for nearly 2 centuries. It has Canada’s highest research budget and has educated four prime ministers and handful of foreign leaders as well as 4 Governor Generals, 10 Nobel Laureates, and 3 Turing Award winners. It is divided into 11 colleges (it was originally run by the Church of England a connection which is still seen in the history of the university’s Trinity College) and has campuses as well in Scarborough and Mississauga. While its medical, business, and law schools are often the pride and focus of U of T, it has always invested talent and money in its engineering faculty as well. The Myhal Centre for Engineering Innovation and Entrepreneurship, for example, provides a cutting-edge environment for innovation and research. University of Toronto makes no bones about wanting to be Canada’s leader in education and innovation. If that’s the kind of competitive spirit that appeals to you, engineering at U of T might be your best bet.